One piece in particular appears designed to upset a delicate disposition. 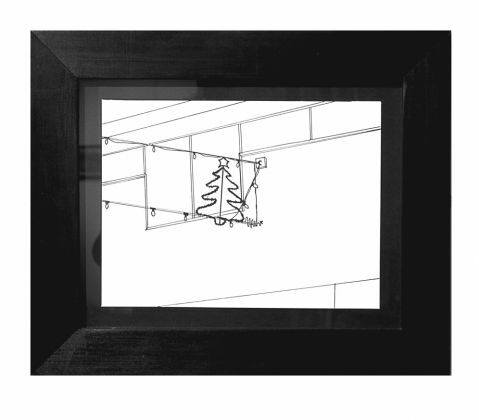 Neil Kelly’s drawing, ‘187 shopping days to go’, was a poke in the eye with a blunt stick,. Drawn in the manner of a grade ‘D’ GCSE piece, it depicts forgotten Christmas decoration hanging around, perhaps in a shopping mall. It waits motionless and powerless in its neglected state, its magic lost. The manner of its depiction reflects its emptiness. It is both ‘badly drawn’ and smartly turned out, echoing in its clean black frame the sad pursuit of appearances in the mirage of consumer happiness. Its naiveté of technique expresses a defiant ‘heroism’ in the decoration with a small and crumbling ‘h’, hanging on in the hope of happiness to come. What to say, what to say? In matters of taste there is no dispute? But it is the reverse, there is permanent dispute. Art is obliged to poke us in the mind’s eye. John Butterworth’s ‘ Shelter’ nods to Kelly’s drawing. Empty, disrespected, the shelter craves sentient contact Marked as they often are, by stray dogs and drunks, these shelters from the elements are a tired reminder of impermanence, the temporality of things. The sun shines, the sea is calm. For the moment there is no storm. Joel Porter’s adjacent ‘Welcome to the Park’ is a series of three digital images of beauty spots within the Lake district National Park. Each image taken at a specific time has, digitally added, all the visitors that arrived over the course of one day. ‘The Plaza space will appear either to be in preparation for, or in the aftermath of, a traditional village fete devoid of home-made lemonade, a raffle or cake stand.’ And in the Kaleidoscope Gallery notes it is written that ‘Bringing rural Britain into the Smithson’s modernist landscape, Fillingham questions the urbanisation of culture.’ Standing where I am on the outside, attempting to understand what is going on inside, these might seem like heavy claims for a collection of ribbons suspended across architectural spaces. But without the conceptual underpinning, can they ever be ‘simply ‘ribbons? What kind of knot is it that ties the ribbons to the questioning of the urbanisation of culture? This piece has remained insistently and troublingly in my mind. There are two works, the ‘original’ and the documentation, connected through concept over space and time, but each arguably and necessarily independently readable. It seems possible to feel in the work, a counterpoint to Hunt’s notion of what the work is not. To discover all that a work is not is to discover the impenetrable reality of lack, of a void. Hunt raises the apparently contradictory nature of an object whose ‘terminations are discoverable without too much fuss’ and ‘…an idea of endlessness ….’. The place, at which experience of the work commences, is neither here nor there; our experience is of hiatus. The work’s Ends are end-less, not-beginnings, cloned non-entities, alternating current – endlessly back and forth, always in-between, all and nothing. Enigmatic? It is not what it isn’t. It is what it is. A tautology? Kate Janes’ piece, Borrow Pit Car Park, of 2008, similarly exists in the memories of participants and as a slide presentation. We are informed that,’Documentation, sequential processes and the setting up and dismantling are an integral part of the work.’ , suggesting that the gallery experience of the documentation is in one sense a partial experience; those who were there and who consequently see the documentation are the only people who will experience the work in its entirety. Photographic documentation privileges the visual. Video recording of the event was a possibility? If so its rejection had aesthetic intentions in terms of the document as work? Gipsy jazz in such a desolate place is an expression of tremendous optimism and at the same time has bitter-sweet undertones. Peckham Peacocks. “‘Peckham Peacocks’ was a mobility scooter meet in Peckham Square commissioned for the launch of Peckham space’s new building in June 2010. The work brings people together in urban public space, in which the artist facilitates what Barbara Ehrenreich termed’ collective joy’ this event challenges established mistrust (sic) in public space, enabling participants to talk to each other and play together…..” This is a different kind of experience. Its narrative, spoken from a time before the event, voiced predictions superimposed on film of the event itself; we see what ‘…will be…’ as it occurs. There is no ambiguity. We enjoy the narrative through images of those enjoying the event. Serena Korda, in her ‘Library of Secrets’ invites us to participate by ‘…leaving our thoughts, wisdoms and secrets amongst the pages of one or more of the 400 books in its collection.’ We are provided with pen and paper upon which to write and then insert our words between the pages of our chosen book. Shades of the confessional, of burdens eased, wishes confessed, truths confronted, catharsis in release. I found the ramifications of this piece unexpectedly moving. It points up connections between secrecy, privacy, honesty, truth, and lies. The secret of a lie is its untruth, and in its openness to abuse, the work lays bare the vulnerability of all of us. 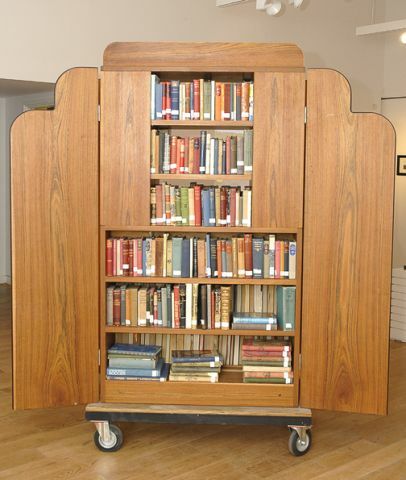 Standing potentially mobile on a trolley, I wonder what secrets might find their way between the pages if it were installed in the other public spaces presented to us in this exhibition? Sophie Lamb constructs a three-dimensional drawing of electricity pylons, using panel pins and cotton, in a corner of the gallery, stretching power lines in a diagonal across the space. We are reminded by this delicate work that the brute force of energy is the endowment of the sublime and the beautiful. Public Spaces is curated by Duncan Brannan, KCC Visual Arts Officer.